The holidays are a special time of joy and giving for all ages. It is also one of the busiest times for mailing out gifts, packages, cards and letters. Most people who mail and ship things out this time of year try to be extra careful with details and often look to decorate their packages, cards, letters with special decorations. That is why the use of Holiday Mailing Labels has become such a popular thing to do. For the gift or card giver as well as the receiver, special holiday labels can offer a fun creative way to enjoy the special times during the holidays. While special holiday seals and labels have been around for use for holiday shipping for generations, special computerized Holiday Mailing Labels are a more recent creation. The use of Holiday Mailing Labels created from home or office computers has become an increasingly popular way that people can add a more personal touch to their holiday gift giving. Through the use of quality Holiday Mailing Labels, people are now able to decorate their packages, cards, letters with a variety of different designs creating a more personal flare to that special person they are trying to reach. These types of labels are used for many things. Some of the more popular uses for these holiday labels include: using them as seals on cards and letters, placing them as special package markers to ensure extra care is given in shipping as well as a vast use to packages, cards, letters and gifts for added decoration and cheer. 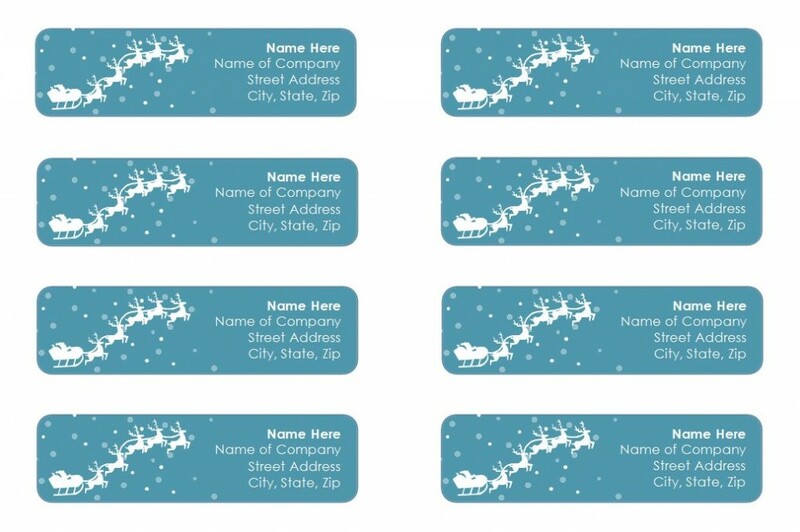 Through the use of our free Holiday Mailing Labels template located here, labels can be created, customized and printed from the comfort of a person’s home or office. The template is free to use and is available for downloading from this website. There are a multitude of choices for special decorative holiday labels including Santa on his sleigh, the Christmas white dove of peace, delicate wintery snowflakes and bright festive holiday wreaths. No matter what design is chosen, these labels are easily downloadable and printable. For people who love to dress up all their holiday cards, special gifts, shipping packages and special holiday letters, our free Holiday Mailing Labels are the perfect answer. They are both customizable and very easy to use. They make the perfect decoration that adds that extra special cheer to all your holiday gift, package, letter and cards.